Iron Pillar of Delhi is a historical monument that allures everyone with its mysterious iron built that has not rusted since its construction that was more than 1600 years back. In spite of being placed in open air, Iron pillar still stands sturdy, presenting an excellent example of scientific and engineering advancement in ancient India. It has become world’s one of the oldest mysteries that archaeologists and materials scientists are still trying to solve. Situated inside the Qutub Complex where the famous Qutub Minar is also located, Iron Pillar stands majestically with a height of 24 feet. It is placed in front of the Quwwatul Mosque in Qutb Complex. Iron pillar is made up of 6 tons of 98% wrought iron, which is also attributed to be one of the reasons for why this pillar hasn’t rusted. There used to be a popular practice where visitors would try to circle the iron pillar with their back at the pillar while trying to make their hands meet. It was believed that doing it would bring good luck to the person doing it. However, due to this popular practice lower part of the Iron pillar bore a slight amount of discoloration. Iron pillar is said to have a protective layer of passive rust on the iron which prevented rusting of the pillar; this layer was getting washed out because of visitor’s constant touch and movements. Hence, to avoid further damage to the pillar’s lower section, a fence was built around it in the year 1997. A peek into the Iron Pillar history indicates the year of its construction and the reason behind. Although the history of Iron Pillar Delhi is still under research and offers many versions of its origin, it does give us some substantial information on Iron Pillar. The inscriptions on the iron pillar were decoded by an Indian antiquarian in the year 1838. These were then translated into English and published in the Journal of the Asiatic Society of Bengal. Before that not much was known about Iron Pillar. As per scholars, the Mehrauli Iron Pillar was constructed during early period of Gupta reign (320-495 AD). This finding is based on the style of execution and inscription on the pillar and the language. In the third verse of inscription on Iron pillar, scholars have found mention of the name “Chandra” which denotes rulers of Gupta Dynasty. However, there are different opinions on whether the word Chandra represents the King Samudragupta (340-375) or Chandragupta II (375-415) who was the son of King Samudragupta. It is also believed to have been made in respect of Hindu God, Lord Vishnu. There are also many theories on where the pillar was built. 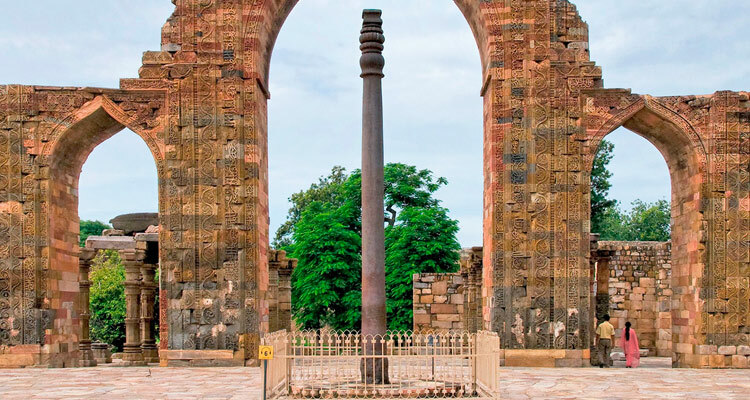 According to one of the prominent theories, Iron pillar was built on top of a hill Udaygiri in Madhya Pradesh, from where it was transported to Delhi by King Iltutmish (1210-36 AD) after his victory. According to some researchers, Delhi Iron Pillar was moved and placed in the main temple at Lal Kot in New Delhi by King Anangpal II, Tomar King in 1050 AD. Iron Pillar Inscription mentions this. 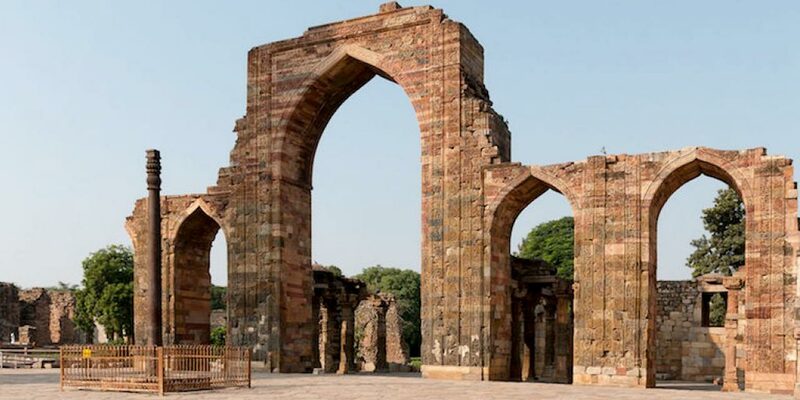 However, in 1191, when King Prithviraj Chauhan who was the grandson of Anangpal, was defeated by Muhammad Ghori army, Qutb-ud-din Aibak built a mosque named Quwwat-ul-Islam in Lal Kot. It was then the pillar was moved from its original location to its current position in front of the mosque. Iron Pillar at Mehrauli has a height of 7.2 meters. It stands on an artistically carved base with a diameter of 48 cm and a weight of 6.5 tonnes. The upper part of the pillar, which narrows slightly at the top, is around 29 cm wide at the tip. The pillar weighs more than 5865 kg. The top of the pillar is adorned with carvings. It also has a deep socket which is said to be the base where state of Hindu Lord Garuda was fixed. Iron pillar has inscriptions carved on it. Some of the iron pillar inscriptions provide a hint of its origin. However, its original location where it was built is still under research. In the middle of otherwise smooth Iron Pillar, there is a prominent indentation at around 400 cm from the current ground level of pillar. It is said that the destruction is because of the firing of cannonball from a close range. As per historians, Nadir Shah had ordered the destruction of the iron pillar at the time of his invasion in 1739. According to some researchers, this must have been done to find precious items or jewels if any hidden inside the top portion of pillar. Some believe that the order for destruction of the pillar must have been sent out as a Hindu temple Pillar appeared undesirable inside the mosque complex. The damage on the southwestern part of Quwwat-ul-Islam mosque which is located near the Iron pillar is said to be during the same period. Hence it is stipulated that the damage must have occurred when the cannonballs were fired at the pillar. The most fascinating part of Iron pillar architecture is the fact that it has not rusted in spite of being in open air for more than 1600 years. Many researches have been done to find the reason behind it. There are two main categories of theories explaining this phenomenon. As per some researchers, the materials that were used in building this pillar are the main reason for its resistance to corrosion. In 1961, it was found out that the iron used in constructing the pillar is of exceptionally pure quality with very low carbon content. It is also been found that the pillar’s iron contains no sulphur or magnesium but has phosphorus. This was found when it was dug out for a chemical treatment and preservation process and later again reinstalled after a masonry base was created around the underground portion of the pillar. There is protective layer called as ‘misawite’ which is said to be preventing the Iron pillar from rusting. While as per other scholars it is the weather conditions of Delhi that has prevented rusting on the Iron Pillar. According to them, humidity is key catalyst for rusting. In Delhi, the climate is dry with less humidity content which for most of the year does not surpass 70%, can be a reason behind the Iron pillar non corrosion. As per another theory, it is the way pillar has been made which has made it resistant to rusting. Ancient Indian metallurgists and advance skills of the workers are also said to be one of the main reasons. Later researchers have found that Iron Pillar Mehrauli was made shaping and hammer-welding pieces of pasty iron with weight of around 20-30 kg. One can still see marks of hammer on the surface of pillar. It is also said that around 120 persons worked for weeks to build this pillar. Opening timings of Iron Pillar Mehrauli is 6 AM and the closing time is 6 PM. It is open on all days of the week. The entry fee of Iron Pillar is Rs.10 per person for Indian visitors and Rs.250 per person for foreign tourists. Delhi Iron Pillar is located inside the Qutub Complex in Mehrauli. It is easily accessible via public transport. There are many city buses that run via Qutub Complex. It can be visited via metro as well. Tourists can get down at the Qutub Minar Metro station on the Yellow Line, which is the nearest metro station to Iron Pillar. If interested, one can also hire a private taxi to the complex from any part of the city. When was Iron Pillar in Delhi Built? The exact construction year of Iron Pillar in Delhi is still under research. However, Iron Pillar inscription give a glimpse into its origin. As per a six line three stanza of Iron pillar inscriptions in Sanskrit which states the name “Chandra” in it, it was built during the Gupta Dynasty. The words Chandra is said to refer to the Gupta King Chandragupta II (375-415 A.D). However, as per some, the word might refer to his father King Samudragupta (340-375). Who built iron pillar of Delhi? As per the Iron pillar inscriptions, Iron pillar was built by Gupta King Chandragupta II. However, according to some scholars it might be during the reign of King Samudragupta when Iron Pillar was built. Why the Iron Pillar in Delhi is not rusted? The reason why Iron Pillar at Mehrauli Delhi is not rusted still remains a mystery. However, there are many scientific reasons which explain this phenomenon to an extent. There are many theories to explain this mystery of Iron Pillar. As per some theories, the purity of the material used in construction is the main reason of its not rusting while according to some it is because of the environmental condition of Delhi which is less humid.